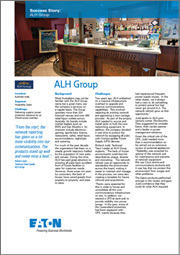 Two years ago, ALH embarked on a massive infrastructure overhaul to upgrade and improve communications capabilities. This involved replacing its existing network and appointing a new carriage provider. As part of the project, ALH needed to source and install racks to hold the new networking equipment. In addition, the company decided it was time to protect the network by equipping all pubs with Uninterruptible Power Supply (UPS) devices. "Racks were essential for this in order to house and consolidate all the core communications infrastructure on site. In addition, we wanted a UPS at each pub to provide visibility into power issues. In the past, some of the Queensland properties had been equipped with UPS, mainly because they had experienced frequent power supply issues. In the other states, we`d always had a view to do something to protect power but had never got around to it. The network refresh gave us that opportunity." Judd spoke to ALH joint-venture owner, Woolworths. They suggested he consider Eaton, their vendor partner and a leader in power management solutions.